Welcome to week 2 of the current Sparkle Creations Rubber Stamps Challenge (SCRSC71)! 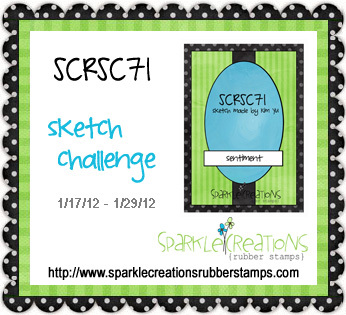 The challenge is a sketch challenge (sketch courtesy of Kim Yu). Accessories: Petite Oval and Scalloped Petite Oval Nestabilities (Spellbinders), Die-namics First Place Award Ribbon (MFT), Markers (Copic), Foam tape, Thread, Sewing machine. This is ADORABLE Steph! LOVE this image and how her leg is over the sentiment panel! 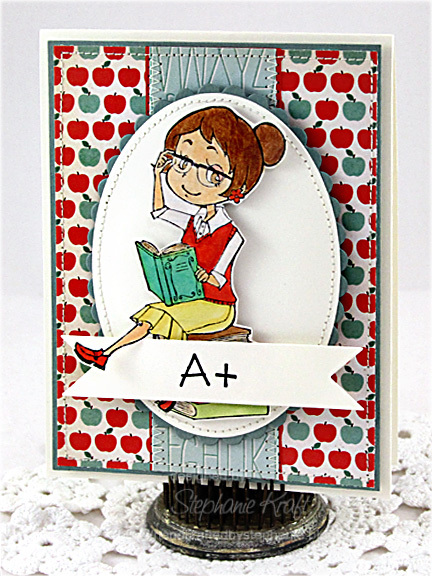 I LOOOOOOOOVE this card--How clever to use those papers with this little image! FUN card! Bright, cute, funny and beautiful. Yes definitely an A+...:)!! So cute Stephanie! Love the apple patterned paper with that fun image! Your stitching looks incredible! Such an adorable card! I love the A+!